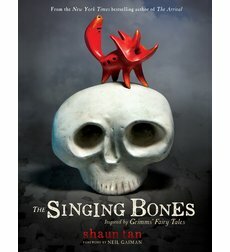 I’m so pleased that those in the U. S. will soon have an opportunity to see Shaun Tan’s brilliant Grimm fairy tale sculptures in the forthcoming The Singing Bones from Scholastic. I first heard of them several years ago when I met the German publisher Klaus Humann of Aladin Verlag who told me about a wonderful new project — having Shaun Tan illustrate (with small sculptures) Philip Pullman’s retellings of the Grimm fairy tales. Since I do read German (poorly) and was eager to see the book I ordered it from Germany and was not disappointed. (You can read my reaction here.) I wondered about this new book and so found more information on Shaun’s website. Naturally I was very keen to bring my illustrations to readers in other languages, but other editions of Pullman’s Grimm Tales for Young and Old precluded this (and worked perfectly fine without them). In any case, there were also many other stories I wished to illustrate so I continued making more sculptures, drawing upon such tales as Thumbling, The Wolf and the Seven Little Kids and Snow White and Rose Red, as well as others less well known. Given the original tales are in the public domain, I decided to make my own book. Fairy tale expert Jack Zipes has an informative essay and comprehensive bibliography in the new book. Philip Pullman introduced the Australian edition while Neil Gaiman did a foreword for the American one. The ARC is gorgeous so I can’t wait to see the finished book. This will be a fabulous gift book this coming holiday season.